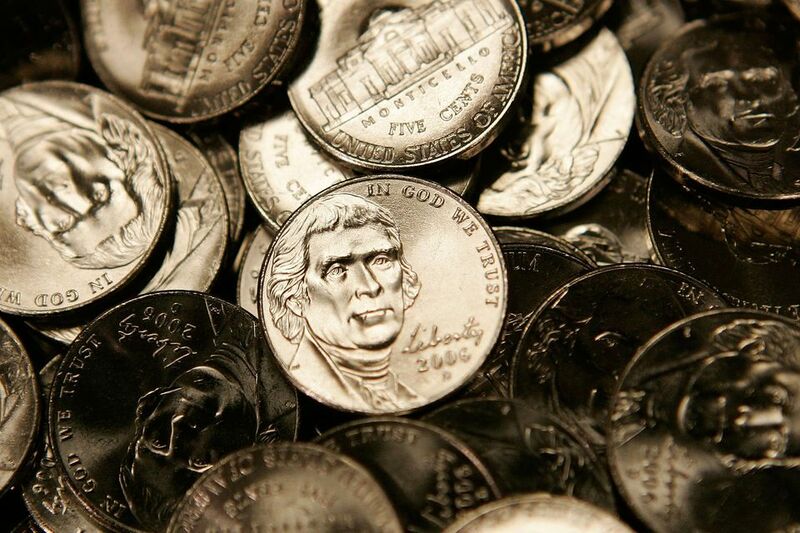 You can start your coin collection with just $4 worth of nickels. This is a great project for kids who are interested in collecting, and also for adults who would like to collect coins but don't really know where to start. This collection will be based on Jefferson nickels, probably the most overlooked of the circulating coin types. It's also the easiest set to complete because it has no rare dates, and Jefferson nickels are readily available at any bank or store. It's best to start with two rolls of circulated Jefferson nickels. Each roll has 40 coins, and costs $2. The best place to get them is a convenience store or other business that deals in small change, and that makes their own rolls. What you don't want are nickels from the bank, where you're likely to get mostly uncirculated nickels. However, if you cannot find a store that will sell you rolls of Jefferson nickels, you may want to try getting them at the bank. Don't be surprised to find circulating nickels that are 50 years old or more. Because Jefferson nickels stand up to wear well, it's not readily apparent that a given nickel is 50 or 60 years old, so the old nickels are less likely to be removed from circulation. Open both rolls and dump the nickels into a medium-sized plastic food storage container. Optional: Add a small amount of dish detergent and some hot water, and gently wash the nickels. In general, cleaning coins is not recommended, especially cleaning them with metal polishes and the like, but when you get coins from circulation they are often filthy and grungy. Gently work the nickels around in the hot, soapy water for a couple of minutes, and then rinse well. Dump them on a towel to dry them. Sort the nickels out by decades. Look at each nickel, using a magnifier if necessary, and separate them into piles according to dates. Make a pile for coins dated 2010 or later, and ones for 2000–2009, 1990–1999, 1980–1989, and so on, for each decade. Starting with the earliest pile, look through the nickels again and keep one from each year. If you have duplicates, pick the best looking one for your new collection, and set the others aside. Things to look for in the "best coin" include the least amount of wear, the least amount of damage or scratches, or the shiniest, newest-looking coin among the choices. Since this is a "year date" collection, you don't need to worry about the mint marks. Take a piece of sturdy cardboard, cut to about 8 1/2- by 11-inch size (a little larger is okay) and set it down landscape style (11 inches wide by 8 1/2 high.) Starting about 1 inch from the top, use a ruler to mark off 7 rows exactly 1 inch high, and 10 columns exactly 1 inch wide. You want to end up with 72 one-inch squares to place your coins into. Draw two extra 1-inch square boxes above your grid, one on the right side, and one on the left side. These are for the 1938 and 1939 nickels. In between the two extra boxes you just drew, write "Jefferson Nickels" in large letters. Now take the nickels you sorted out earlier, and start placing them on your grid in their proper places, starting with the 1940s in the top row, all the way down to the 2000s in the bottom row. Once you have them all laid out, and are sure you have selected the best specimen for each date, use a small piece of Scotch tape to affix the coin to the cardboard. Roll a small piece of tape into a sticky cushion and stick it to your board. Then press the coin onto the tape to hold it there. Congratulations! You have just started a Year Date collection of Jefferson nickels. Keep looking through pocket change, or buying a roll of nickels now and then, to fill out your collection. Every single date of the Jefferson nickel series, except the 3 years when only silver "war nickels" were issued (1943-1945) can be found in circulation today. Since there are no rare dates in the entire Jefferson nickel series, it is an easy collection to complete. Good luck. You can expand your nickel collection by considering the mint mark on each nickel. The mint mark can be found on the reverse to the right of the dome on nickels from 1938 to 1942, and 1946 to 1964; above the dome on some 1942s and 1943 through 1945; and on the obverse from 1968 to current. Nickels minted from 1965 to 1967 have no mint marks. For all other years, if it was minted in Denver, they will be a letter "D" for the mint mark, and an "S" if it was minted in San Francisco, and if it has no marks it was minted in Philadelphia. The full date and mint mark Jefferson nickel collection cannot be completed out of circulation, but the 2 key coins (1939-D and 1950-D) are inexpensive to buy, less than $15 each. You can organize your collection with a Whitman Jefferson Nickel Folder for about $4.00 (Compare Prices). The folder has a slot for each date and mint mark so you know what coins you are still missing, plus the folder has the mintages on it, so you know how rare your coins are. If you decide to become a serious collector, do not use tape on the coins or wash them.